PTSuks Uncanny World: Video : Mis-Adventures In Fallout4!!! S01E02 - "Outside" + Bonus - Unlimited CAPS + Cryolator! 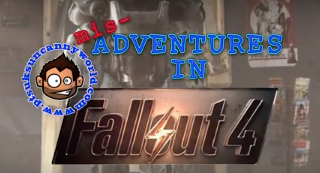 Video : Mis-Adventures In Fallout4!!! S01E02 - "Outside" + Bonus - Unlimited CAPS + Cryolator! Latest video of my Mis-Adventures in the world of Fallout4! I head outside, find Codsworth, that it is now the year 2277, give or take a decade, the neighborhood is pretty much abandoned except for some insects! THE GIANT KIND! Woot! GAME ON!!! BONUS! - The rabid fanbase hase figure out two unique "giltches" in the game so far, one will net you that sweet weapon in the overseers office from the vault, The Cryolator! Just need your trusty dog by your side otherwise known as Dogmeat!